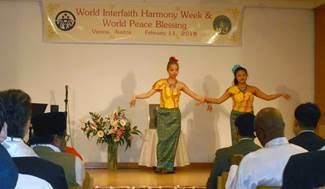 On Sunday, February 11, 2018 the Universal Peace Federation of Austria, the Family Federation and Women’s Federation organized an Interreligious Service commemorating the World Interfaith Harmony Week, which concluded with a World Peace Blessing. 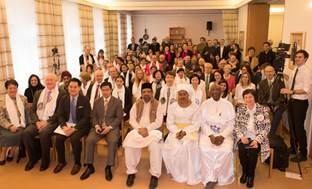 The event was held at the Austrian headquarters of the Universal Peace Federation and was attended by 240 people. 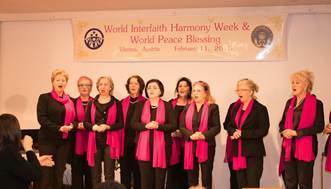 The celebration started with the Bosnian women choir “Mimosen” conducted by Selma Aljovic singing two songs. In preparing the event the Austrian Thai community played a central role, because Phravithetpunyaporn (Phramaha Boonthin) Wat Phutharam, Representative of Thai Buddhism in Sweden, payed a visit to Austria together with Mrs. Ingmari Kikucchi, the President of the Swedish Family Federation, in order to support the event. 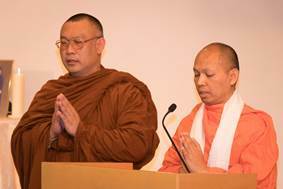 The Austrian Representative of Thai Buddhism, Sompong Pongsomboon of Wat Thammaram and more than 20 members of the Austrian-Thai community joined the program. After the Bosnian women’s choir two Thai ladies performed a traditional Thai dance, which was appreciated by everybody. 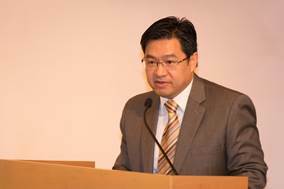 We were honoured to welcome the Minister Councellor of the Royal Thai Embassy, Mr. Bolbongse Vangphaen and the First Secretary, Mr. Korakot Parachasit, to our event. 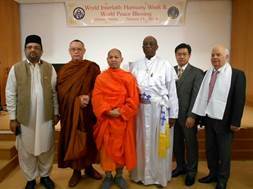 After the welcome remarks by Mrs. Elisabeth Cook, President of the Austrian Family Federation, Mr. Bolbongse Vangphaen gave a short explanation about the World Interfaith Harmony Week and expressed his appreciation towards UPF for holding an interreligious event and bringing cultures together. 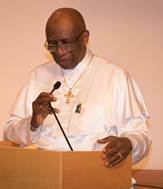 After Mr. Haider’s speech the religious leaders present were asked to say prayers for peace and several couples participated in a World Peace Blessing. After their prayers Dr. Wolfgang & Keiko Czerny, a senior couple from the Family Federation, led the World Peace Blessing Ceremony. The couples shared a small cup of wine or juice as a symbol of their unity and love for one another. 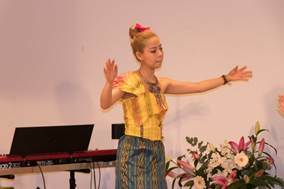 As a closing the audience could enjoy another traditional Thai dance, before everybody was invited for lunch. 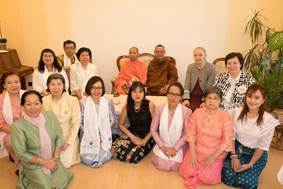 The participants enjoyed the festive atmosphere and the organisers were specially grateful for the support of the Bosnian women choir, the Thai monks, the representatives of the Royal Thai Embassy and the Viennese Thai community. Annual UN Observance Week: Feb. 1-7. 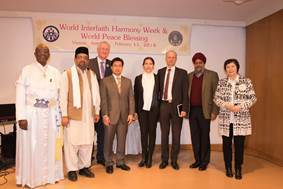 UPF Austria celebrated the World Interfaith Harmony Week for several years in the Vienna International Centre (United Nations).